It's the 5th Tuesday of the month so it's time for another I Read It! 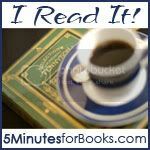 carnival over at 5 Minutes for Books where we look to find out what you might have read that we recommended. Did you like it? Hate it? 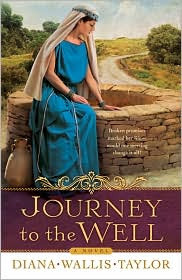 The team members take each other's recommendations as well and this past month I took the liberty of picking up one of Melissa's suggestions, Journey to the Well (see Melissa's review by clicking on the title). Like Melissa, I'm not really a big fan of novelized scripture (and I'm not really a big fan of Christian fiction either!) but the story caught my attention and I really wanted to see what this book was all about. At our church, over the course of the past year, we've been talking about what it means to be a 'true worshipper.' The passage of scripture that talks about the woman at the well (John 4) has been discussed (more than) a few times and so I probably felt more drawn to reading this particular adaptation of the story than I would have otherwise been. Now, I cannot honestly say that I liked this book. Nor can I honestly say that I did not like this book. It has its pros and cons with me. On the one hand, I thought the author gave too much detail about this woman's "bedroom", shall we say? She was discrete but I thought she also painted too detailed a picture at times. I realize that she was trying to share, historically, what it would be like for a young woman of 14 to marry and how terrifying that experience might have been. But still. This book is one of those times when I wish fiction would leave statements of fact to non-fiction history books. Whenever historical fact of this nature ties itself into a non-fiction read, I feel like the subject is over dramatized to play on the emotions of the reader. On the flip side, you might say that you might "really know" the characters or that they become "real" when you can identify with them so closely, knowing their highest mountain top experiences as well as by walking valleys with them. For my part, I just wish she had left a few details out. 2. She was well-known enough for her sketchy past that when she ran into the people saying, "Come see this man who knows all I've done!" (v.29) people sat up and took note. They thought enough of her existence (even if they thought about it negatively) that when she came into contact with the crowd, they listened to her crazy yelling. In other words, she suffered miserably for a time. Some of us (including myself!) might say to God, "WHY are you taking me through this rough season? For what purpose!?" But I do believe that what Romans 8:28 says is true - that all things will work together for the good of those who love God and are called according to His purposes. To state it bluntly: the people listened to her calls for them to come and meet Jesus because of the reputation she had (and it can be assumed that it was a bad one)! She had to have had some type of standing in the community - be it good or bad - for the crowds to willingly come running at her behest. We do not know what this woman's life was like before meeting Jesus at the well. How exactly did she come to have five husbands and be living with one who was not her husband? Diana Taylor's interpretation of her life until that time is mere fabrication and I still am not really sure what I should think of that. I don't know if the novelization of scripture is a good thing or a bad thing and in some ways I think it's too soon to tell. In twenty years, we'll probably have a better idea. (I know what I think of the "cartoonization" of scripture in the form of Veggie Tales. I once had a little kid inform me that the Bible story I had related to them wasn't really how it happened. "That's not what happened on Veggie Tales!" Henceforth I've carried a little bit of a grudge against Veggie Tales retelling of Bible stories.) I'm NOT sure what the effect of such novels will be and so I hesitate around them. That said, the story was impacting, engaging, created a cast of characters that I was keen to know and plenty of suspense to see how Taylor would tie things all together. On this one I would not say that I have a firm opinion on it, precisely for the reason that I just don't know what historical effect such writings will have on Christianity. I think it is something that we ought to think about, for sure. Do you have a thought or an opinion that you'd like to share on that topic? I'd really love to hear it! In the meantime, thanks, Melissa, for offering a selection that was good to "chew" on. I am very glad that I read it. I appreciate your review and appreciate YOU for the things that you also hold dear! Thank you for your faithfulness. Interesting. I'm not a fan of Veggie Tales either, primarily because they tend to take a moralistic view of Scripture rather than a Christ-centered one. Hmmm...interesting, Carrie. I've never thought about the impact of such stories on Christianity, mainly because I just read them as a fictionalized account. Interesting.